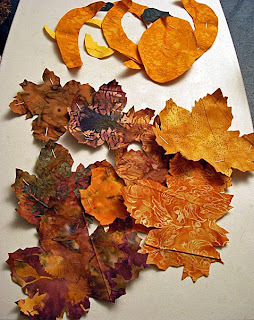 I finished applying the fusible web to my fall colored fabrics. Then sat down for a night of House and Biggest Loser (courtesy of Tivo of course) and began cutting, cutting, cutting. When the programs were done so was my big job of cutting. It made it go so fast. 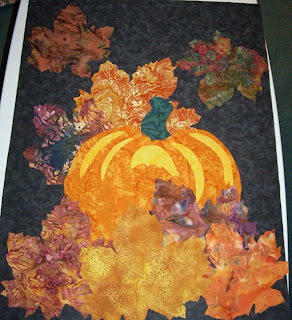 Yesterday, I arranged the leaves and pumpkin on their blender black background until I had what I think will work. Several of the fabrics are so similar in color that they tend to blend together. But, once I sew the edges down and add the center veins, I think it will separate the colors better. To seal down the applique, I use one of those Pressing Sheets that seem like they are Teflon. Nothing sticks to them and they seal the applique very nicely. Here's a link to the one I use. Of course, best when purchased with a coupon. As my vacation is winding down, we just returned from a visit to Pittsburgh to visit with family. The fall colors on the Pennsylvania turnpike were just beautiful. We found ourselves taking photos along the way. At one point, we even pulled over (with the zoo in tact since all animals went to pgh as well) to take photos. I have to say that we have been very lucky these vacation days regarding the weather we have been having. It's starting to turn cold now. Here are a few of my favorite photos from our pgh trip and one close to our home. When I first saw the "leaves" I thought they were real and I was going to read how you screen printed or something-Your fabric choices are great!! I can't wait to see it done.